New for 2011, the AL-KO 42BR Comfort offers multiple functions and unbeatable value for money, all whilst incorporating european build quality at an entry level price. The new 42BR Comfort is a 42cm push propelled rotary mower. 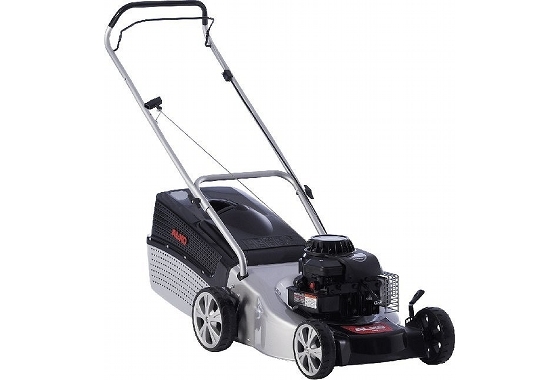 Powered by a reliable Briggs & Stratton 450 Series engine, this model also benefits from the AL-KO 3INONE function – with collection, mulch and rear discharge capabilities all from one value for money machine. Improvements to this 2011 model include new height adjustment handles, colour coding, and the innovative AL-KO Service Position, which enables the mower to stand on end for cleaning and service access underneath the mower deck. As With all AL-KO Comfort models, the ULTRAMOW steel deck features a conditional 5 year homeowner warranty. AL-KO Service Position: An innovative AL-KO concept, this mower has a unique Service Position which enables the mower to stand on end when the fuel tank is empty. This enables easy cleaning and maintenance of the underside of the mower deck. Filling Indicator: The grass collector features a filling indicator, to alert the operator exactly when the box requires emptying.